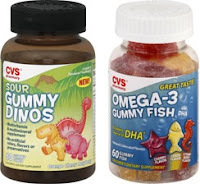 Possible FREE Kids' Gummy Vitamins at CVS! Don't forget to scan your card at CVS's coupon machine. There are reports of it spitting out a coupon good for a free bottle of CVS brand kids' gummy vitamins. These will be B1G1 free next week, so you'll be able to get two free bottles with the coupon!